The first thing I uncovered on a recent sleuthing adventure! This dress is made of a glorious glossy fabric which may be a polished cotton. I just love the finishes put on many of the old textiles that far excel anything that is sold today in the mainstream market. With cap sleeve styling, wasp waist, full skirt and, of course, excellent tailoring which includes a hem width of several inches, some lucky girl looked stunning. The ladies garment workers union label testifies to the care and expertise of these tailors half a century ago. When I spied this one, I could hardly wait to see what else the day’s expedition might uncover. 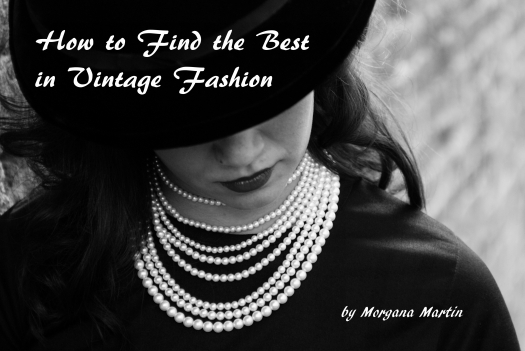 The treasure hunt continued, and you just never know . . . . . . . . . . . . . . . . . .
We’ve done a little film noir leisure dressing for the men, so here are 3 of my very favorite women’s things of the same era. The fabulous ’30’s robe with shoulder pads and tassels, the cute little wartime rayon dressing gown and the glam ’40’s rayon dressing gown. Hollywood movie star all over! Imagine Veronica Lake or Joan Crawford sweeping into the room. Deanna Durbin would have looked sweet in that blue and white dressing gown. I like to recline in one of these while sipping a cognac and reviewing the latest assignment. . . . . . . . . . . . . . . . . . . . .